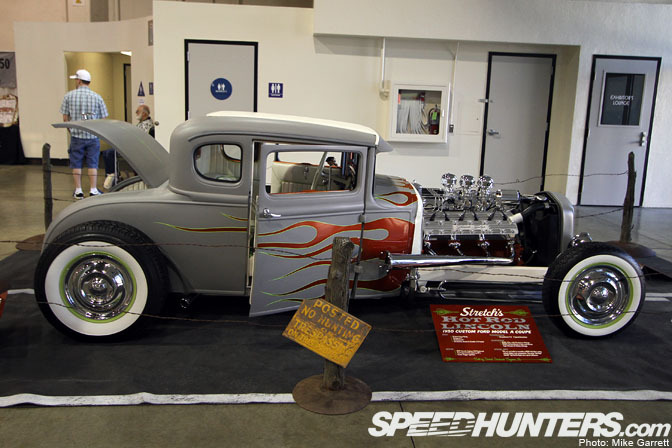 Yesterday I shared the wildly cool "Van Go" with you guys, now I want to spotlight one more car that caught my eye at the Grand National Roadster Show – a 1930 Ford Model A Coupe powered by a Lincoln V12. Before I even got a close look at the engine compartment, the Model A stood out with its period looks. Then I saw the power unit. 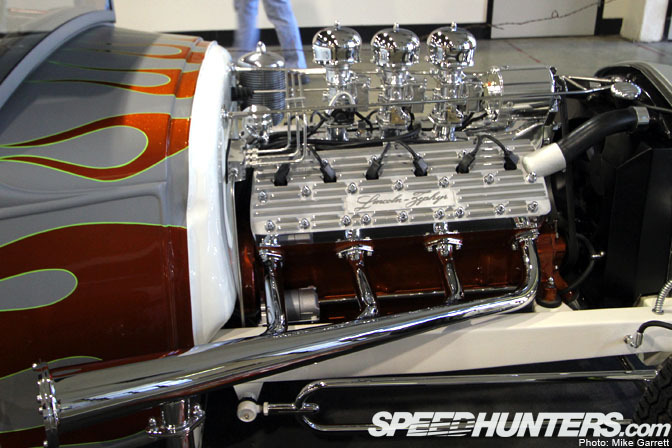 It's a flathead V12 out of a 1947 Lincoln Zephyr, fuel injected with Stromberg 97's. 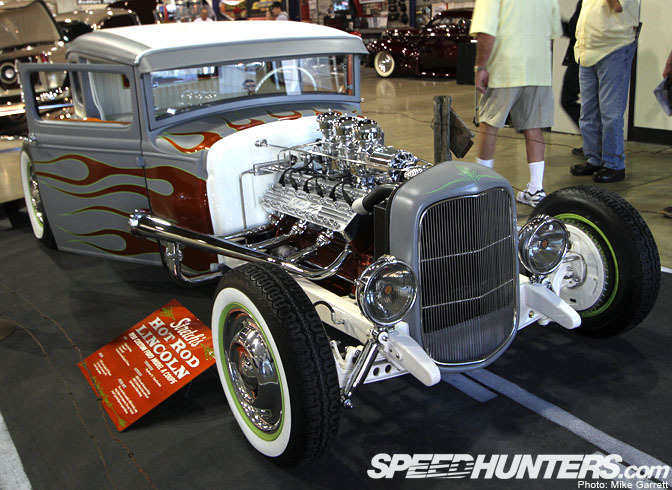 The entire build was inspired by the song "Hot Rod Lincoln" by Charlie Ryan. 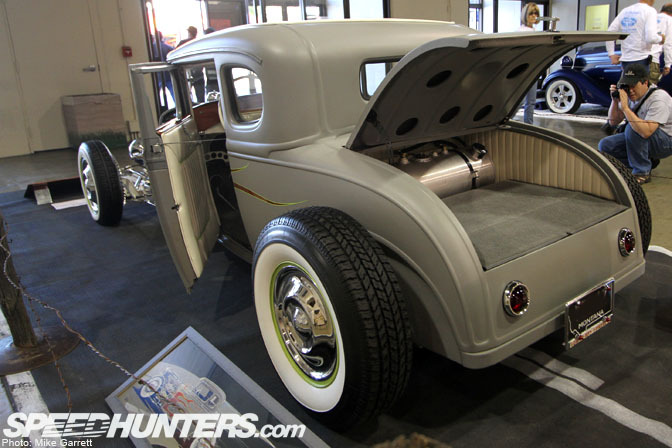 The Model A itself has an original steel body that's been chopped by four inches and channeled by eight, with a stretched frame. 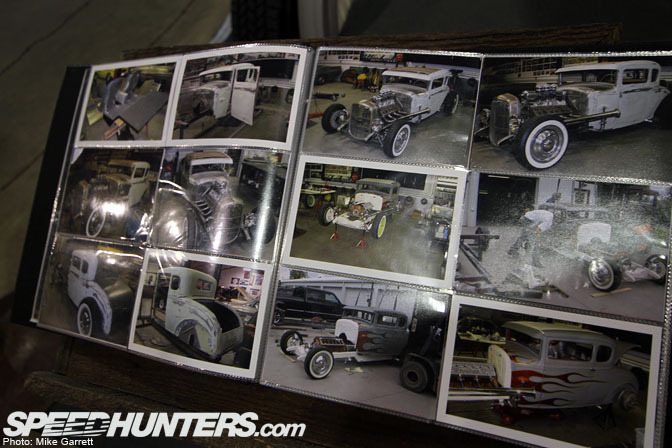 There was a photo album full of build pics to flip through. It's always crazy to watch a car like this come together. 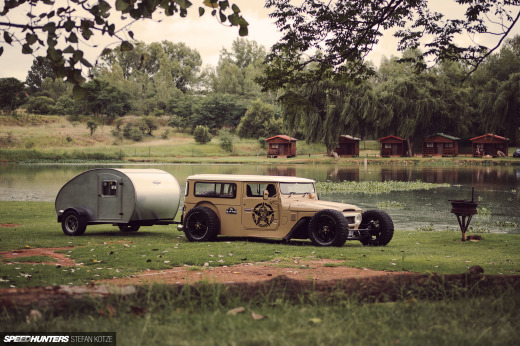 The Model A made the trip to the GNRS all the way from Montana. 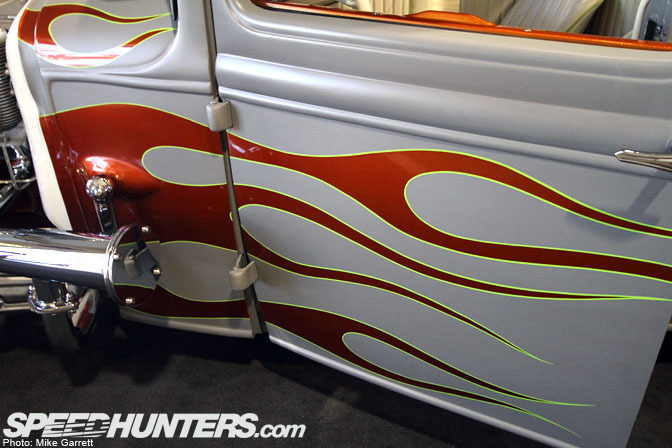 Dark orange flames on flat gray bodywork. Nice combo. Every year there are dozens and dozens of incredible hot rods at the GNRS, but with its unique engine choice and spot-on styling this one gets my pick. FLATHEAD V12--NEED YOU SAY MORE? That V12 looks so much like a regular flattie I may not have noticed the extra plug wires had you not said something! Killer! The intake on that alone is worth over $2k easy!! 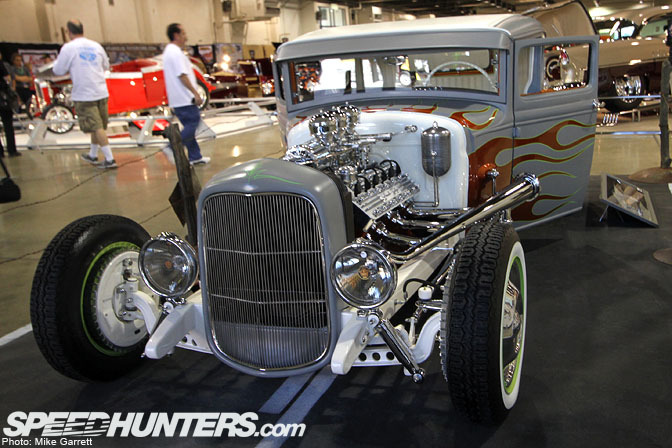 I never knew there was such a thing as a flathead V12! That's nuts! I wonder what it's like to shift with such a long lever. incredible! even more impressive than van-go. 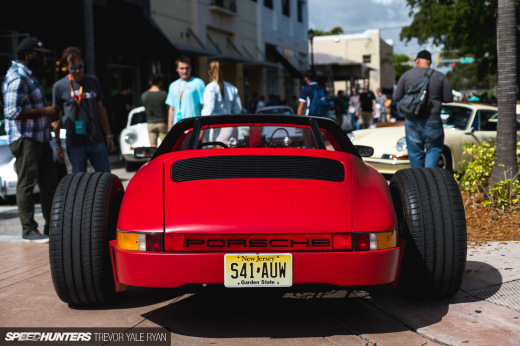 thanks for the write-up and great pictures. @ Mr. Moons- Those flat-head V-12's sound GREAT! I've had one fire up with open headers while I was taking a picture of the header. It was GREAT! im not sure if its just me not knowing much about this engine or what? but this engine has 12 spark plugs..but only 8 exhausts manifolds? can someone explain that? does the front cyl come out the front manifold, the back to the back, and 2nd and 3rd on each side go into one, and 4th and 5th go into the one??? Awesome! "Son you're ganna drive me to drinkin' with that hot. rod. Lincoln.' Great car. It has been ages since I last saw a flat V12 used ina rod. Awesome car. 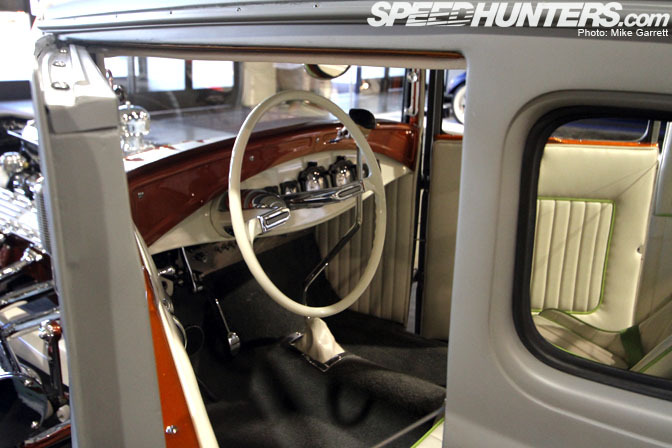 I want that steering wheel. now this is one that'd be great for a Video Roll, spot on colour choice! it looks a million dollars! great pictures too. Looks awesome but I'm not a fan of the paint job. I don't like the grey and the flames look a bit cheesy. I would love to hear it run though.